Charlotte, May 24 – Electrolux today announced the donation of more than $200,000 in refrigerators as part of a community outreach effort taking place this week throughout North America. During the week, Electrolux employees have been giving back to the communities in which they live and work by volunteering and donating appliances. Capping the week in Charlotte, where the Electrolux North American headquarters are located, employees donated two 18-wheeler trucks filled with new refrigerators and vacuums to Crisis Assistance Ministry. These will be donated to needy families and individuals. Also refrigerators were donated to the Loaves and Fishes Food Pantry, which will distribute them to local soup kitchens. “We are committed to giving back to Charlotte and are very pleased to be volunteering across North America,” Truong added. Although Electrolux has a strong tradition of product donation and volunteerism among its employees, this week marks the first time the company has held community outreach efforts across its North American locations simultaneously. Crisis Assistance Ministry will distribute the refrigerators through various partner agencies who work to eradicate homelessness. For more information, please visit crisisassistance.org/refrigerators. Electrolux is a global leader in household appliances and appliances for professional use, selling more than 40 million products to customers in more than 150 markets every year. The company focuses on innovative solutions that are thoughtfully designed, based on extensive consumer insight, to meet the real needs of consumers and professionals. Electrolux products include refrigerators, dishwashers, washing machines, cookers, air-conditioners and small appliances such as vacuum cleaners sold under esteemed brands like Electrolux, AEG, Eureka and Frigidaire. In 2012 Electrolux had sales of $16.3 billion and 58,000 employees. 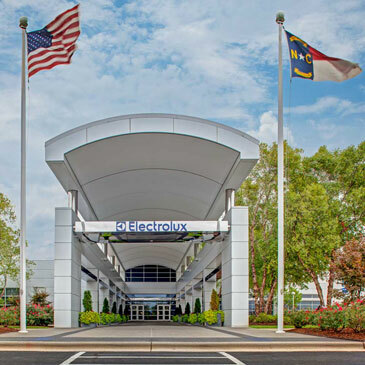 The Electrolux North American headquarters are located at 10200 David Taylor Drive, Charlotte, NC 28262 in University Research Park, where they have been based for nearly three years. For more information go to www.electrolux.com/press and www.electrolux.com/news/.